At best, close passes of cyclists, sometimes called near misses, put riders at risk. For others, the intimidation whether intentional or not is a risk that is simply too high. They would like to do so, but they don’t cycle for this reason. West Midlands Police is the first force in the country to fully appreciate this and commit to a bold and intelligence-led enforcement operation to protect vulnerable road users. 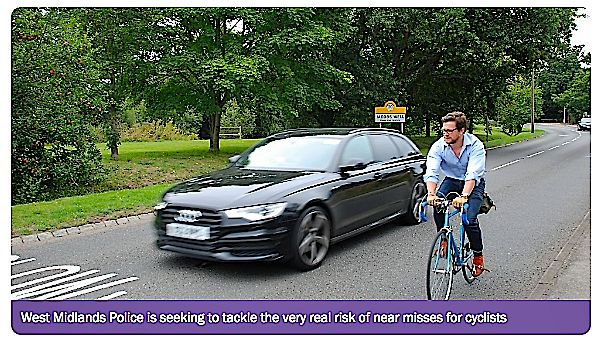 Highway Code rules clearly state that drivers should allow vulnerable road users as much room as they would a car when overtaking – but many people seem not to know this, and many who do ignore it. Now West Midlands Police has launched an operation that sees officers saddle up on some of the region’s busiest routes looking out for motorists who put cyclists at risk. Police cyclists will radio the details of close-pass drivers for in-car colleagues to intercept at a designated holding point. Drivers will be offered a road-side educational input on safe overtaking but repeat offenders – or anyone deemed to have driven dangerously close to a cyclist – can expect to be prosecuted and taken to court. “Cyclists have been campaigning about close passes for years, with limited success. The priority is given to tackling close passes, and the appreciation of the danger they present for cyclists, has varied between police forces. “This is the first time a police force has come forward with a plan to prioritize enforcement against close pass drivers. It is quite simply the best cyclist safety initiative by any police force, ever.